Alanouwaly Guinea has continued to grow foods, particular in the rainy season after we fundraised for the initial planting. The Christmas Appeal 2014 raised the funds to buy 2 sheep, 3 goats, and 12 chicken and their stables. One of the goats immediately gave birth to triplets. These projects are self-sufficient and don’t need our funding anymore, they are a good example of how an initial investment can set up projects funding themselves. UK members are also impressed by the Guinean people’s capabilities of feeding themselves in an environmentally sustainable way. We are hoping that we are able to communicate this value and achievement to our Guinean partners. There is still much that they are lacking (like access to safe water), for which we are looking for long-term sustainable ideas along those lines. The chicken started produce chicks in summer 2015 and by October 2015 15 young chicken have been given to families around the area. 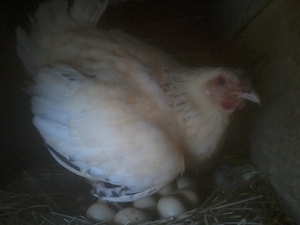 They are producing 10 eggs @ day which contributes volunteers nutrition. All the animals are completely free-range and produce organic. The eggs have an amazing bright yellow egg yolk. The sheep have helped a local farmer to stay afloat in an emergency situation and around 19 chicks were given to various local neighbours before the rest were decimated by an epidemic. 1 survived and lives with a neighbour now, as Alanouwaly needed to concentrate on the computer and drilling projects. The neighbours who received chicks want to give some to Alanouwaly when they are ready. The goats are doing very well with up to 19, creating an income. Like the charity, Alanouwaly’s food keeps on growing, for example the 2 lemon trees, the guava, the coco and palm trees are a good height now with lots of yield, there are many pineapples. 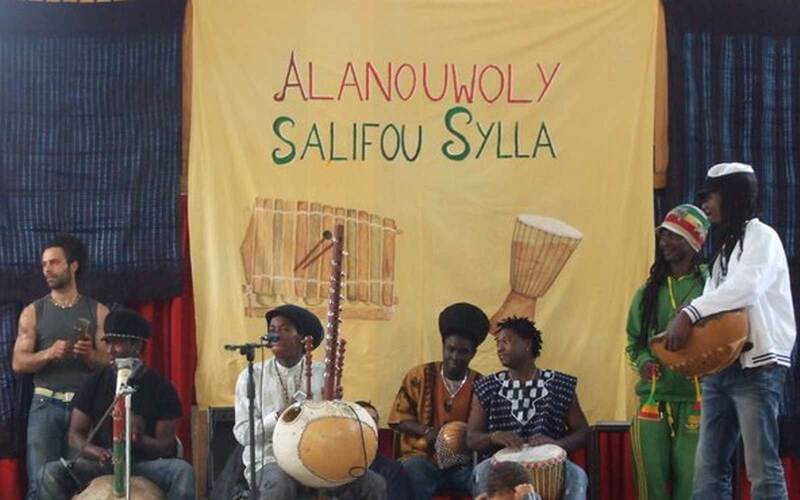 The Annual crops are planted depending on other activities, and Alanouwaly Guinea has encouraged & motivated many young volunteers & visitors to join in the growing programs. In the rainy season the families around Boke are amazingly self-sufficient. All food is organic and fresh, of very high quality, as the locals have no other way of growing it!